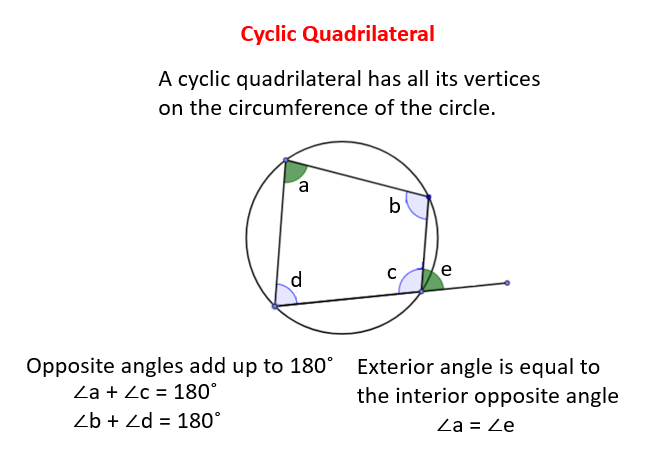 Examples, solutions, videos, worksheets, games and activities to help Geometry students learn about cyclic quadrilaterals and angles in a semi-circles. The following diagram shows a cyclic quadrilateral and its properties. Scroll down the page for more examples and solutions. This video explains why the opposite angles in a cyclic quadrilateral add up to 180 degrees. If an angle is inscribed in a semicircle, it will be half the measure of a semicircle (180 degrees), therefore measuring 90 degrees. Angles in semicircle is one way of finding missing missing angles and lengths. Pythagorean theorem can be used to find missing lengths (remember that the diameter is the hypotenuse). Also, the measure of an angle formed by a chord to a tangent is half the intercepted arc. A demonstration of the Circle Theorem that the Angle in a Semicircle is a Right Angle. How to use Angles in a semi-circle theorem to find missing sides and angles?